Good karma invites more art-making this spring! 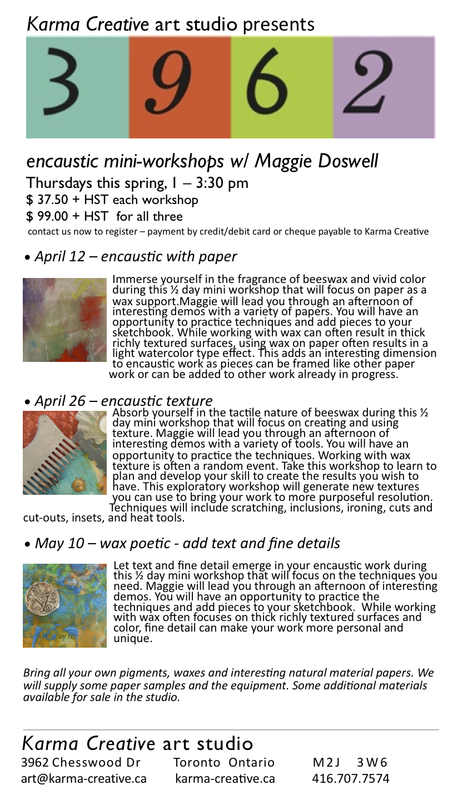 Join us for one or more in our encaustic mini workshop series. Immerse yourself in the fragrance of beeswax and vivid color during this ½ day mini workshop that will focus on use of paper. Maggie will lead you through an afternoon of interesting demos with a variety of papers. You will have an opportunity to practice the techniques and to add samples to your sketchbook. While working with wax can often result in thick richly textured surfaces, working on paper can also result in a light watercolor type effect. This adds an interesting dimension to encaustic work as pieces can be framed just like other paper work, or can be added to other work already in progress. ← Agustin Rojas – Catch his passion for printmaking in a 1- day workshop this spring!